Buying snow toys for boys is pretty easy these days. The boy is a simple creature. Point him in the right direction (the backyard) or a local snow covered hill. Give him some toys that will allow him to interact with his buddies and provide a physical challenge and maybe, just maybe, by the time he comes inside he will be too tired to give you a hard time. Exhausted and well exercised little men with a rosy glow on their faces from the sun is what we are aiming for here. Boys have this incredible ability to do the same thing over and over again without getting bored. As long as it’s physical and maybe provides a little thrill along the way. 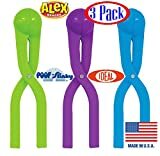 Whether it’s ripping down the snow covered hill on a new flying saucer or building snow forts and having all day snowball fights, there is a shiny toy available to keep the little men healthy and happy all day long. This gift set bundle comes with 3 different colored snowball makers. Get your boy and his friends making multitudes of snowblalls for the ultimate all day snowball fight. 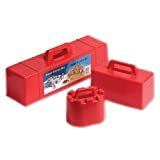 This great winter gift for ages 5 and up is made of durable plastic with easy to use design. Speed of snowball making makes your kid the winner in this fight. Hours of fun for children 3 years and up. This snow castle kit comes with 3 form shapes so that creativity comes to the forefront with these snow castles. The great thing about this toy is that you don’t need to pack it away at the end of snow season. It doubles as a sand castle maker. Two toys for the price of 1. This is truly a beginner snowboard for kids up to 100lbs. No special boots required for this board with adjustable slip in bindings. Textured stomp pads under the bindings provide a non slip surface for optimum footing. 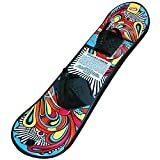 At 97cm (37.5 inches) in length this heavy duty constructed snowboard is the best way to learn safely and have fun at the same time. This 1 rider snow sled is made to last for years with High Density Polyethylene construction. The top of this cool sleek black snow sled is covered with an anti slip surface for better comfort and safety. It comes with and attached pulling line to make it easy to get back to the top of the hill for more fun. This tobaggan is hand made with knot-free steam-bent, flexible basswood with a lead free, marine grade finish. It is a 6 footer and has a weight limit of up to 600 pounds. Built for years of family fun it is recommended for children 5 years and up. Wow, what a great and functional toy for all seasons. This scooter converts from a traditional scooter with wheels to snow scooter with skis in minutes. It folds quickly and easily for carrying and storage. 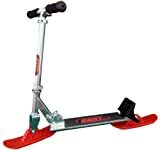 It is for ages 5 and up with a rider weight of up to 140 pounds. With safety in mind it includes a “sure stop” snow brake and safety leash for snow riding. Another two for the price of 1 toy for all seasons.